The Opening date for the Sunday Brunch, Lunch, and Dinner Season Will 5/22/16! 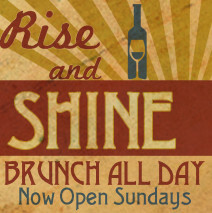 Nirvana Wine & Grillerie will be open on Sundays starting @ 11am for brunch, lunch, and dinner! Brunch is made to order, and of course, always made from scratch! Brunch will be featuring signature crêpes, artisan omelets, french toast, eggs and bacon, steak and eggs, and more! Brunch and lunch will be offered from 11am until 4 pm. …And don’t forget about the bubbles!.. mimosas w/ fresh oj, champagne, cava, and prosecco!